As I sat in the Porsche Experience Centre restaurant, looking out the panoramic windows casting a gaze over the complex with Silverstone GP circuit in the background, it suddenly dawned on me that despite the pessimism that soaks the soul as you witness the fine mist of rain in the atmosphere, you can’t help but accept it only makes you a better driver. It’s a given that at any time I have an organised event involving the car, I can almost always guarantee rain. Let’s not forget that this was my second scheduled visit as the first one was canceled due to snow. 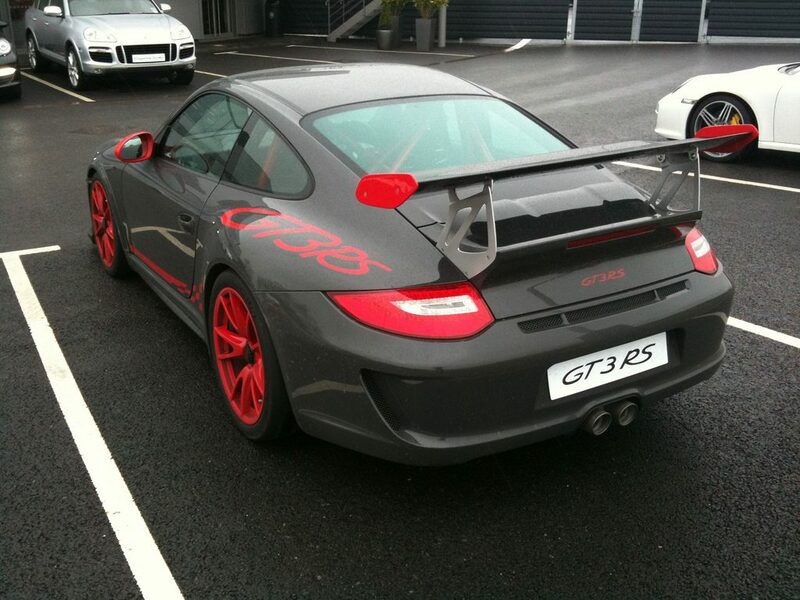 Regardless, I’ll not let the process of precipitation ruin a drive in one of 2010’s most anticipated cars, the new GT3 RS Gen 2. The Experience Centre is a fantastic place, it’s a very cosy, intimate environment housing very expensive cars such as the LMP Spyder, Carrera GTs and the odd Silk Cut car. Each visit has a different set of cars so it’s a dynamic, changing place with great hospitality and even better food. My instructor and I enjoyed the fantastic roast lamb lunch and soon made our way through a rather simple briefing session which is catered quite clearly for people who’ve never driven a fast car before. The centre provides experience days for every new car purchase from Cayenne Diesels to 911 Turbos so the diversity of character and experience is vast. 15 mins later and I’m sitting inside the new (soaking wet) RS. Initial impressions are of course, wonderful. I challenge any petrol head to maintain a consistent BPM just looking at it. It’s one of those few cars that looks fast just parked. With an exaggerated aerokit promoting downforce by way of its massive, beautifully shaped carbon fibre spoiler and its deep, sculpted front skirt, it’s a candid car that simply does not hide its intention. Stepping inside and here some cynicism prevails. Going from a purely functional aesthetic on the outside, seeing some of the minor gimmicks made me chuckle. Such as the cord pull doors (which really save nothing but add consternation when closing the door) and the delete air-con function, no sat-nav and lightweight car battery are weight saving features that cannot beat a pure and simple diet! Starting the engine and we’re introduced to a fantastic baritone note that is ever more prominent thanks to the perspex rear window. 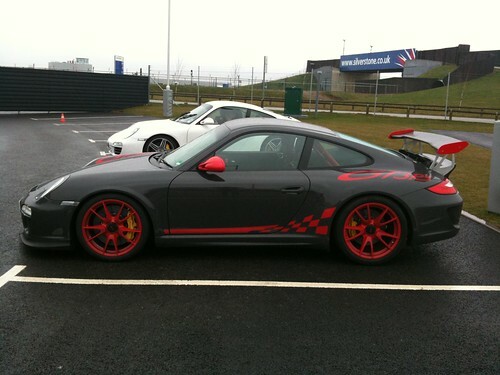 In note and pitch, it’s the same sound as my red Gen.2 GT3, but slightly louder, owing mostly to a titanium exhaust and perhaps a more liberal carbon airbox. It’s a delicious note and I couldn’t help but constantly prod the throttle when at idle throughout the whole day, you cannot tire of it. Notch one to the RS.2. Snick the gear lever into first, release clutch and you also notice that the car has become civilised. There’s less clutch chatter, the gearbox is well behaved and the new carbon seats don’t creak. Naturally there’s a lot to be said for a brand new car, but this had 1500 miles on the clock versus my 3600, so it’s not a huge difference. 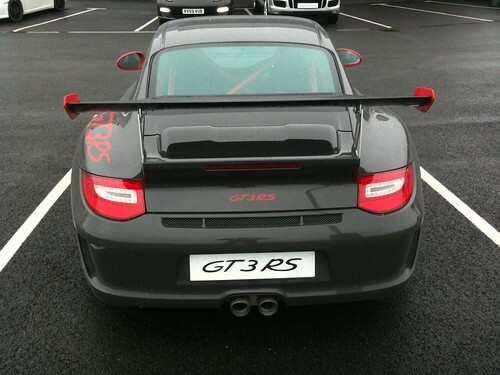 Also, this was a pre-production model, the only RHD car on the road – or not, as it’s not legally allowed on the road. The first thing you notice is the new front end – with that wider track, it offers a near elimination of understeer. Even in the wet, once the tyres were warm, it had tenacious grip, allowing that oh so familiar delicacy of balance between front and rear wheels. Oversteer is also on demand, typically in lift off fashion again, but the over zealous protection of the instructors refused me any deselection of traction or stability control. Irksome to say the least, but from the hard forced tail out moments that even went beyond the intervention of any technology, it’s quite clear that the car retains its progressive and benign nature on and off the limit. That 3.8 is a magnificent engine. It’s a true spiritual sibling to the retired 3.6 lump, sharing all the characteristics of its high revving nature without any of the set backs of capacity increases. 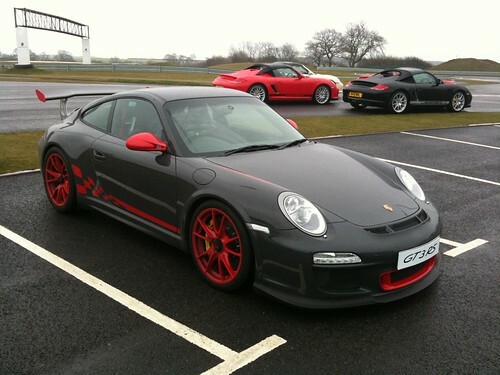 You can notice the difference between the Gen 1 and Gen 2 cars, that extra 200cc makes some small, but noticeable, difference with a more tractable low revs pick up, leading to slightly punchier mid-range making some of the high rev shifting typical with the previous generation GT3’s a little redundant. I found myself short shifting a few times, apart from that delightful howl, there really isn’t a valid reason to wring its neck all the time anymore. There’s even better stability in the harsh left – right switchbacks too, with the balance of the car remaining unprovoked. That wider track providing excellent reassurance. There’s a wonderfully poetic moment when you get a bend right in the RS called the slingshot. Get your angle right, as you wind off your lock coming off a bend, hit the throttle at the right spot on the apex and the car is slung with supernatural efficiency onto the straight, reinforcing the slow in, fast out methodology of the GT3. It’s devastatingly rewarding and demonstrates the absurd levels of mechanical grip offered by an off-the-shelf car. I can only imagine how insane it could be with a track geometry set up. After an hour and a half of abuse, the heat build up in the car brought on a sweat in me (no air con guys, c’mon!) so I decided I’d had enough. As I pulled it in, it was quite clear by the onlookers which car was getting the most attention. And who’d blame them? The RS really does look fantastic. Incredible given how the internet was so scathing of it when wraps were first taken off. Can’t help but feel I’m smitten. Walking away, I stepped towards my car with those comparative thoughts of ifs and whys. The most comforting thought is that I’ve got £30k sitting in my bank – ultimately, is it £30k better? Probably not, no. But then that’s a logical, pragmatic decision out of sync in a world born from passionate ideals. 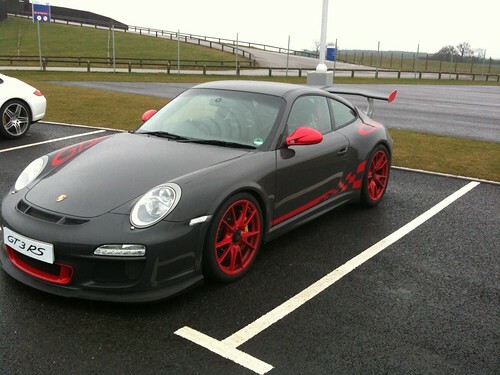 And who wants to be sensible when you have a Grey and Red in the garage? Oulton Park, wavey landscapes and tyres, tyres, tyres…..